I have been gardening all my life and I've found that time is all it takes to make gardening enjoyable. Now with over 10 years of garden blogging and counting! Last week it poured at the house. My wife and I sat out under the porch while we watched heavy rain and hail fall from the sky, which fortunately didn't destroy any of our plants. As the water gushed off of the roof in torrents I sighed wishing I had rain barrel. Then last Friday my inlaws were in town and picked up three blue 55 gallon barrels which now sit in the back yard. I have one in place under the spot wheer most of the rain comes off of the roof. It's easy to tell where it is even when it isn't raining since there is a permanant hole there. It hasn't rained since, at least nothing to write home about. So, I now have 3 mostly empty rain barrels. It's supposed to rain this weekend but the rain has missed my house in general even though it has rained all around our area in great quantities the clouds seem to split apart and let the sun shine on my house. I guess I'll just have to wait and see. We have peppers! In this area we have five pepper plants, labels kept with them so we would know what they were when we got around to picking peppers off of them. Really though it shouldn't be that hard if they've ripened well enough. If I knew my peppers better then I would probably be able to tell from the look of the plant. They really do look different. On the front porch we have another area of plant growth. The lavender really wants to be planted in a sunnier place and has decided to reach for the sun as best as it can. The marigolds are hanging off the other side apparently content with their pot in life. Out back the garden is doing well enough. It really has grown since this picture especially in the back where the onions have taken off. It's mostly green now. Some of the tomatoes in the middle don't look so well but I'm going to wait until the tomatoes ripen before I decide what to do with the plants. I think I might have to remove some of them. Not to worry though, I have plenty of small tomato plants that are eager to take their place. I bed everyone has this problem at some time during their growing life where you plant seed after seed of a favorite plant just to have it only produce one plant which seeds so fast you can't use the leaves you planted it for in the first place. This is exactly what happened when we planted basil last year. It grew just a little and went to seed. This year we at least had seed but we have an unjust shortage of pesto. So this year my wife planted plants and seeds. This little boxwood basil plant is one of the many plants we now have growing. Among the others are a whole slew of purple basil and regualr basil. She didn't know if they would sprout very well in the pots so there are several pots with little sections in each one. I think they all sprouted as well as some from the seeds we didn't get that have been waiting in the dirt for spring to arrive. One of our neighbors also brought us these other plants which she didn't know the english name for but said they worked well in fish and other dishes and that they were prolific seeders. She recommended planting them far apart so they don't cross breed. After just a minute of looking I figured out what it is she brought. 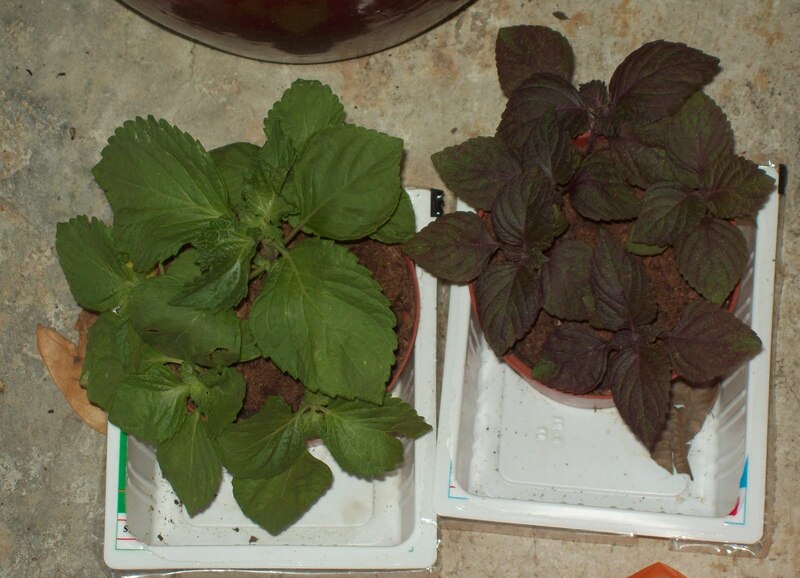 Theyare called perilla or chinese basil or mint. I guess it depends on who you ask. Still need to put these in the ground somewhere but they're doing pretty well so far. I might even bring oue out to the community garden this weekend when we plant it out. Most of us want our daisies to have beautiful flowers on them. It's the entire reason we planted them in the first place. So when they look like this your first instinct might be to pull them up and toss them. Especially here in Texas they don't do so well. They come from South Africa where the climate is quite milder. Temperatures here can get over 110 sometimes whereas their native land tops out in the mid 90's. Sure it freezes there sometimes but they don't mind that so much. What you don't see is the new flower forming inside there that is due to bloom in a day or two now and the wonderful new plants that you can have by planting the seeds from these flower heads. The seeds are relatively easy to start. After the flower head has dried up for a week or so just remove it and either remove the seeds yourself or let them dry some more until they fall out. Plant the seeds on the surface of moist soil in temperatures you wouldn't mind living in yourself which makes a kitchen counter perfect for this. Cover the pot with plactic wrap making sure you have some space between it and the soil and let it germinate. 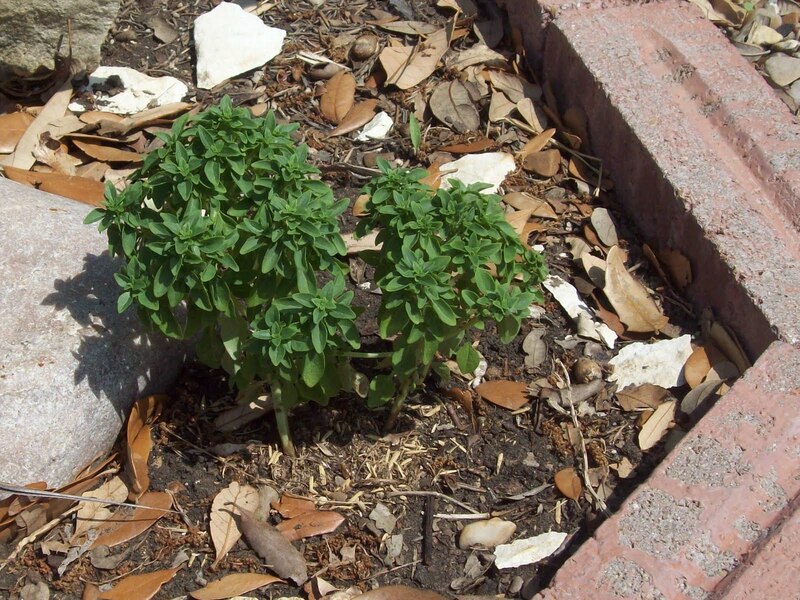 once you see them sprouting remive the plastic and let them grow in a greenhouse or under grow lights. Transplant when they look big enough. Some people like to keep them in 3-5 inch pots so they will want to bloom while others stick them outside. The onions have sprouted and are growing well. We sprinkled some rosemary in the beds and it has worked so well that we've since added it to all of our pots that we're trying to grow things in. I don't know how or why a cat would decide to climb into a ten inch pot a foot off of the ground to do it's business but they seem to have a knack for it. I've thought about many other ways to rid the neighborhood of these menaces but I'm way too nice to try any of them. I can't even bring myself to get a dog. I don't mind them wandering through the yard as long as they don't try leaving me any presents as they do. Ok, maybe if they left mice that would be good, or opossums. I really don't think the cats around here have what it takes to take on a opossum though. The snow peas have also arrived which the cats have fortunately left alone. The pot must not be enough of a challenge for them to worry about. I have since thinned them to only four plants while seven are shown here. Some of the lettuce plants have also sprouted but not very well yet. The zuchini has decided to grow pretty well on the other hand. Since this picture it has gotten three times bigger. We have also put bamboo teepees on this and other climbing plants. It's not that I don't have flowers in the garden, I just don't ever remember to post pictures of them on bloom day! These amaryllis have been blooming for over a week now. I don't really remember when they started but it's been a while. Some other flowers have bloomed and gone without any photos this year but they were still really appreciated and kept us motivated to get the yard cleaned up so we can enjoy our flowers in a nice tidy yard. The roses have really taken off this year with an almost dazzling display of flowers. This guy has bloomed for a while now and clings tirelessly to the fence in hopes that the wind won't get the better of him. So far he has withstood gusts that have blown quite a few things over our yard, generally the stray plastic bag from a local grocery store. Overall I believe it has over a hundred flowers. Today I put up some trellises for the hops to grow up. I started out wanting to put in an arbor but soon realized it would look too big for the space. Now I'm sore and tired and only have a little bit to finish tomorrow. It's growing by inches each day now andmore sprouts are popping up. If the summer sun doesn't kill it then we should have a good crop of hops flowers this summer. The hops are growing like weeds, actually better than the weeds. I wasn't so sure these things would break the ground around here. It's hot and unrelenting at times. It's sure to need plenty of water when the heat arrives. Currently it's only in the high eighties at worst. Next week or two may hit the nineties. Next month the hundreds are possible but fortunately not likely. In the mean time we get to pamper them and hope that we can get them to have strong roots and something to climb. They haven't minded the wind so far even though it blew off part of the greenhouse roof again. The fig tree isn't doing half bad itslef in that regard. There are currently only three that are growing well. The fourth has broken ground but isn't going anywhere for some reason. The fifth is currently a no show. Someone we haven't had a problem with is the cone flowers. They have sprung back up and are threatening to amaze us with their flowers again. There are about twice as many as last year and I keep seeing new clumps rising out of the ground. The spring cleaning WEEKS have paid off. If I knew it was this hard to keep a garden growing I might have just gotten rich and hired a gardener. That getting rich part I think might have been a problem though. Yet another fast grower is this little fern that my wife bought to replace some of the plants that didn't make it so well last year in the shade. They grew this much in under a week. If I could only get my tomato plants to grow that fast and healthy then I wouldn't have to go to the store for a while. I was out and about today and saw the most beautiful lettuce so far this season. It's yellow flowers shining in the sun while the already ripening plump beans weighed on the flower stalk. They also had a lot of other veggies growing including leeks and cabbage. Their flower variety was also impressive with iris and rose and a few lillies. Work was in progress though and I'll have to wait a week or so for it to all be done it seems. Planting has been pretty successful this season. My wife has planted a lot of seeds for various veggies and flowers. Some of them have already broken through the ground and shown us their little leaves while others are still germinating. The transplants have been very successful. I have an entire new bed of peppers and tomato plants. One of the tomato plants didn't like the watering too much today but I believe it will pop back upright, didn't check after I went in. Should rain again soon so I'll just let it be for a while. On the fig front the figs are getting big. I just have to hope and water. As long as the figs are strong the wind shouldn't knock them off. My wife went out today to the Fort Worth Botanical Gardens to help the Fort Worth Cactus and Succulent Society with its annual cleanup of the cactus area and greenhouse. There are a lot of different kinds of cactus there including the ones shown here which overwintered in the greenhouse. If you live in the area you too can check out a wide variety of these hardy plants either at the Botanical Gardens or if you want to take some home, which you can't do at the Botanical Gardens, you can check out the 28th annual show and plant sale which will be held at the Ridgemar Mall at I-30 and Gren Oaks Road in West Fort Worh. It will be going on May 6, 7 & 8, 2011 during regular hours. Not only can you buy them, you can also ask experts what to do with them. Some of the parts, like cactus tuna, are edible and quite tasty if you know how to prepare them. Sometimes we can take it for granted when a plant decided to grow for no other reason than because it was designed to. We tend to call them weeds, after our kids I think. These little guys grow all over our yard and although we mow them down quite a lot they are edible and can replace onion in any dish that requires either green or white onions that are chopped. They are a bit stronger than normal onions and you can therefore use a little less than normal onions. They have really good flavor though. I tried one on a dare. This pile was left at our house by a friend so I figured it was a good time to take a pic and give myself a note when they would be available. Happens every year. The hops plants have finally sprouted! It took less time than I thought it would and the sprouts look strong and happy. Only two of the plants have broken through so far though. Not sure how long the other three will be before we see them. This means that we'll have to build a trellis soon so they have something to climb. Fortunately our tomato plants are growing. There are already three tomatoes and they're just getting bigger. This also doesn't include our fig tree (no picture included) which has many large figs.